Coach Kevin Cooper shakes the hand of Josh Spearin upon his induction into the athletic Hall of Fame. Each day, hundreds of people pass by the wall of plaques on the way to the back of the school by the cafeteria; however, not many take the time to stop and read about the athletes the plaques are honoring. These plaques describe the Hall of Fame inductees, the first being from the class of 1963, and their athletic achievements. Every five years, three more former students are selected for their athletic achievement in high school and beyond. This past October, Hannah Branch, a swimmer from the Class of 2007, Nate Doehler, a football player from the Class of 2009, and Josh Spearin, also a football player from 2009 were the latest athletes to be inducted. Hannah Branch was a swimmer for the last three years of her high school career. She was named a Maine Sunday Telegram All-State swimmer, was part of the Maine state high school all-star team, and was an SMAA all-star in 2004, 2005, and 2006. In 2006 she was also the Class A swimmer of the year and the New England champion in the 200 individual medley and 100 fly. Hannah was also the state champion in the 100 fly, 200 individual medley, and 200 free. She holds eight individual records along with five relay team records. Few people knew that Hannah was dealing with serious ear problems while she was racking up awards. Hannah said she swam for the love of it and is proud of the example she set for her teammates every day. “I think my teammates were most successful not because of what I accomplished, but because I was almost like their teacher. I inspired them, I set an example. I showed them how to love swimming,” she said. Nate Doehler played football and basketball all four years at BEHS, and ran outdoor track for his last three. He played on the state champion football teams in 2007 and 2008 and was named Player of the Year by the Portland Press Herald. An All-State team quarterback, and an All-SMAA first team quarterback, Nate received the Dave Allen Award, as SMAA Player of the Year, as well the James J. Fitzpatrick Trophy in 2008. After graduating, Nate attended the University of Maine Orono on a football scholarship for two years before moving to Utah with his family. Josh Spearin was an All-SMAA first team selection at offensive line in the 2007 and 2008 seasons and won the Gerry Raymond Award in 2009, given to the state’s most outstanding lineman. 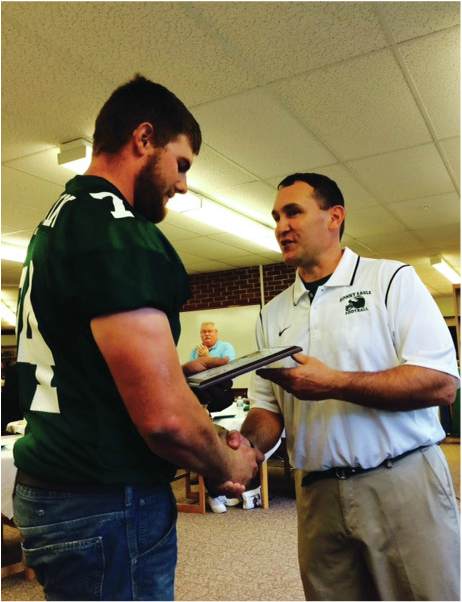 Josh was named the Portland Press Herald’s All-State first team offensive lineman in 2007 and 2008. He was also one of three captains on the state champion team in 2008 and was named to the SMAA All-Academic team. Josh continued playing football on scholarship for the University of Maine at Orono as a starter at offensive tackle all four years. In two of those years he was selected as a second team all-conference player at left tackle and was part of the all-academic team in 2012.